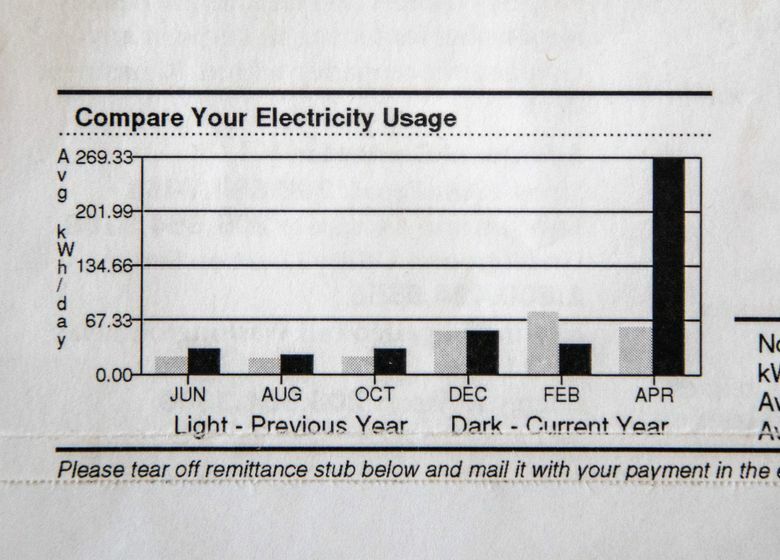 You’ve heard about those erroneous Seattle City Light bills? A Laurelhurst couple — two retired, longtime customer specialists for the utility — got hit with such a bill. Even they had a hard time navigating the billing maze. If anyone should have been able to deal with an out-of-proportion Seattle City Light bill, it was this couple. Bob Klug, 72, worked 23 years at the utility, retiring three years ago as a strategic adviser. That means he worked with large commercial and industrial customers. His wife, Linda Lockwood, 72, worked for City Light for 27 years. She retired at the same time, and also was a strategic adviser. One of her areas of expertise was metering and billing. In April, they got a bill at their Laurelhurst home for $2,002.04, covering two months. Compare that to the highest bill they had received last year — during winter — for $608.74. In some cases, the errors began when readings were estimated and not done in person by a meter reader. Scary dog in the yard. Gate locked. The meter reader was sick that day. Perhaps that estimated reading was low. Then, when at a later date, there was an accurate in-person reading of the meter, City Light billed for the underestimated amount. The stressed-out customers weren’t satisfied with that response. Over 200 of you posted comments, usually along the lines that this had happened to you, too. In the case of Bob and Linda, you’d think they would know how to maneuver through the City Light bureaucracy to get things straightened out. Yet here they were, out of frustration, resorting to that time-honored last-resort custom of venting to the mayor. That’s not quite how Bob and Linda see it. Bob and Linda are meticulous people. Do you keep six to seven years’ worth of utility bills? They do. Would you be able, or even want to, compare three billing cycles for 2018 with three billing cycles for 2017, and then carefully explain that to a customer-service representative? Would you, as they did with the letter to the mayor, hand-deliver it and get it time-stamped by the receptionist? Or send a letter to Jim Baggs, City Light’s interim general manager and CEO, via registered mail with a signed receipt card? One of them, Scott Feldman, a health-company financial director, did what is a common practice these days. He Googled Bob and Linda’s names. Up came their LinkedIn profiles with City Light. A suspicion crossed Feldman’s mind that perhaps Bob and Linda were in some manner acting undercover for the utility — not very smart about hiding their identities — and contacting somebody like him who had gone to the media. But no, say Bob and Linda, insisting that they had joined all those other overstressed City Light customers. They got to experience being told by a supervisor that they could appeal their high bill to a City Light hearing officer. A form would be mailed to them. They received a one-page document on May 3, and it said they had five business days to answer. Bob says he worked three days to detail all that happened, and make it fit into the one-page form. He managed to do so in 30 lines of densely packed print on the front, 13 lines on the back. On May 8, they mailed it. On May 11, Ivonne Golborne, the hearing officer, denied their appeal. “ … your appeal letter was postmarked six (6) business days after supervisory decision, so your letter was mailed one day past the five (5) business day rule,” wrote Golborne. What can you do, but vent to the mayor? • The meter reader did not conduct a personal visit to their home, so the reader estimated. • Then, when the meter reader did show up, the meter failed and wouldn’t display correctly. • When that happens to one of the old meters, they are replaced with the “advanced meters” that the agency has been touting, and will send automatic reading to a computer six times a day. • When the advanced meter was installed, the technician didn’t input the reading from the old meter. Instead, it registered as a zero. “The billing system understood that zero to mean that the old meter had rolled over from about 90,000 kilowatt-hours to 100,000 kilowatt-hours,” Thomsen, the City Light spokesman, explains. • And so, Bob and Linda, here is your bill for $2,002.04. Bob and Linda say they finally have been credited for $1,241.98. In the letter that the couple wrote to the mayor, and which was then passed on to City Light, they said that they hoped for a meeting “to talk through the issues” of billing errors. They believe such mistakes have affected other customers. They say they haven’t heard back.